Let us take a train journey into Africa. It is here, beneath the 1,000 metre high sandstone face of Table Mountain, that Jan van Riebeeck dropped anchor on 6 April 1652. He established a refreshment station for the Dutch East India Company to replenish the ships en-route to and from the spice islands of the East Indies (Indonesia and Malaya). Before Van Riebeeck landed others had long lived in the blue shadow of the mountain. They were the Khoikoi pastoralists with flocks of fat-tailed sheep and the San Hunters who lived off game animals. These ancient remains of Mankind’s Stone Age childhood were innocent onlookers who by 1713 had been all but decimated by the Great Smallpox Epidemic. After 1702 black tribes were encountered for the first time about 700kms east of Cape Town around the Great Fish River, by eastward migrating white farmers - a meeting of two divergent cultures the consequences of which are still unfolding today. Huge granite outcrops, the largest of which is Paarl Rock dwarf the attractive town of Paarl. Founded in 1720 the ‘pearl ‘of the Berg River valley is built on both sides of a 10-kilometre street, shaded by oaks and jacarandas. Many of its beautiful historic monuments can be seen along the oak-shaded Main Street, and the 1787 Oude Pastorie (old parsonage), now housing a cultural museum and the Dutch Reformed Strooidakkerk (thatched church), completed in 1805, are among the more notable national monuments. The Gideon Malherbe House in Parsonage Lane was the home of Gideon Jozua Malherbe, one of the eight founders of the Genootskaap van Regte Afrikaners, which was formed in the house in 1875 and laid the foundation of the Afrikaans language. Amongst many of the owner’s original possessions is the printing press on which Die Patriot, the first Afrikaans newspaper was printed. Nearby, on the southern slope of Paarl Mountain, stands the Afrikaans Language Monument. Lying at the southern entrance to the Hex River Valley is Worcester, founded in 1818 and named after the Marquis of Worcester, brother of the governor, Lord Charles Somerset. The Worcester district accounts for a quarter of the national wine production with close to twenty wine co-operatives and several brandy distilleries. On the outskirts of Worcester lies the Karoo National Botanical Garden, which covers 115 hectares of the foothills of the Brandwag Mountains. This garden, opened in 1948, is devoted to the succulent plants of the Karoo, many of which bloom profusely in spring. 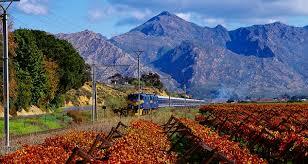 From De Doorns, 477 metres above sea level in the Hex River Valley, the railway climbs up the face of the escarpment in sweeping curves which, if put together, would have taken a train through 16 complete circuits in 25 kilometres before it reached the top of the pass 959 metres above sea-level. In the early days only limited loads could be hauled up the pass and at least two steam locomotives were required. The difficulty of taking a railway through the barrier of folded coastal mountains of the Western Cape and up the escarpment of the central South African plateau, provided engineers with a problem. The engineer, who first solved it, Wells Hood, given the technical limitations of construction in the early days, did a magnificent job and the first railway pass carried traffic into the interior from 1876 until 1989. A new pass, located by W H Evans, was opened in November 1989. It involves four tunnels, two of 0.8 kilometres each, one of 2.4 kilometres and one of 13.5 kilometres. There is a saving of 8 kilometres over the length of the old pass. A single line goes up the pass, but in the centre of the longest tunnel there is a crossing point where trains can pass each other. The Hex River Mountains are the highest in the Western Cape. The tallest peak, the Matroosberg (2 250 metres), towers over the broad valley below where some 175 grape-producing farms produce most of South Africa’s export grape harvest. Fine old Cape Dutch houses, quaint reminders of the Amsterdam townhouses of the early Dutch settlers, are dotted among the stitched patchwork of the vineyards. In winter, the beautiful mountains surrounding the valley are covered in snow. 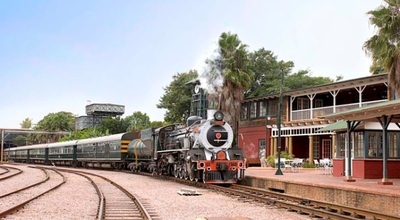 When the railway line was built from Cape Town to the north, the first major staging post, locomotive depot and marshalling yard after Cape Town was built on the banks of the Touws River (‘ river of the pass ‘) at the summit of the Hex River Mountain pass. The Karoo, being both high and exceptionally dry, offered solace to Victorian sufferers of Tuberculosis (Consumption). An official of the Cape Government Railways, James Logan, arrived in Matjiesfontein in 1890 to recuperate from chest complaints. He found his transfer to the Karoo so beneficial he decided to settle in the area. He bought a farm, named it Tweedside, planted trees and wheat, built a fine house, sank boreholes and gradually acquired considerable land holdings. Major Buist, a descendant of Logan’s, still lives here. The Laird Logan set up a small refreshment hotel for the hungry and thirsty travellers of the Cape Government Railways (CGR). 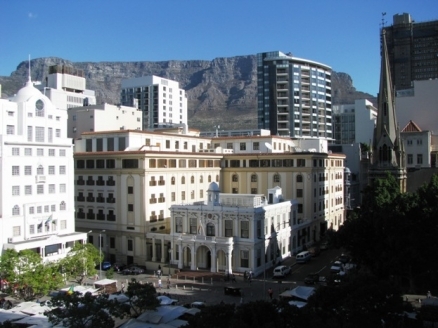 The graceful old hotel is named after that much-maligned British imperialist, Lord Milner. Having undergone a long apprenticeship under Lord Cromer, the British ‘agent’ in Cairo, Milner was appointed High Commissioner for South Africa by the then British Colonial Secretary, Joe Chamberlain in 1898. It was he who insisted that Paul Kruger, President of the old Transvaal Republic, extend the franchise to include the ‘ Uitlanders ‘ (the Afrikaans terms for foreigners) who were, after all, paying taxes and who had lived for 12 years in the Transvaal. Kruger flatly refused to share his Republic with others, an attitude which led to the declaration of the South African War (Anglo-Boer) in 1899. During the war (1899 – 1902) Matjiesfontein was the headquarters of the Cape Command and hosted 12 000 British troops. 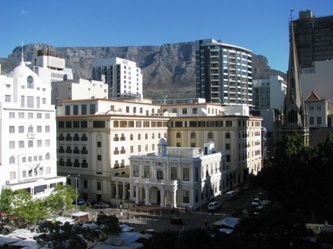 The hotel was used as a military hospital and its turret became a lookout. This authentic Victorian railway village stands perfectly preserved at Matjiesfontein, which legend has it, is occasionally visited by the ghost of a wounded British ‘Tommy ‘of the Anglo-Boer war. Matjiesfontein’s most famous resident was writer and feminist. Olive Schreiner. Her first novel ‘Story of an African Farm ‘, was set in the Karoo, and gained immediate international recognition. After spending time in Europe, she returned to find relief for her asthma. She loved Matjiesfontein, and lived in a small cottage where she kept up correspondence with a number of English friends including William Gladstone, George Bernard Shaw and Havelock Ellis. 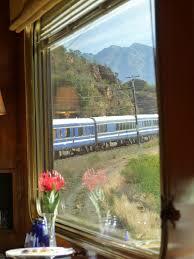 “I love the Karoo. The effect of this scenery is to make me so silent and self-contained. And it is all so bare, the rocks and bushes, each bush standing separate from the others, alone by itself ‘. 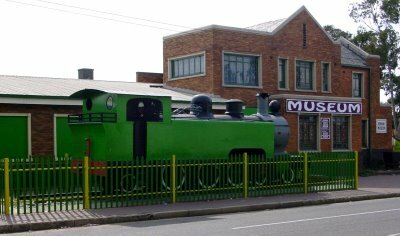 When the railroad reached Beaufort-West in 1880 it became a marshalling yard and locomotive depot. Founded in 1818, the town was named after the fifth Duke of Beaufort, the father of the then Governor of the Cape, Lord Charles Somerset. 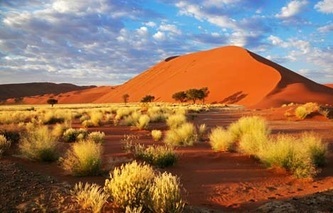 The town was established at the foot of the Nuweveld Mountains on the banks of the Gamka River, which only flows after rain. 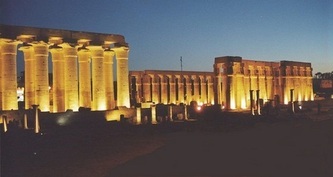 The town became prosperous with the introduction of merino sheep. One of its early citizens, Sir John Charles Molteno, a wool trader and champion of responsible government and nicknamed the ‘Lion of Beaufort ‘founded the first bank in 1854. He was to become the first Prime Minister of the Cape. Beaufort West is the largest town in the Karoo and became the first municipality in South Africa in 1837. Victoria West will be of particular interest to guests accustomed to the convenience and comfort of intercontinental air travel. 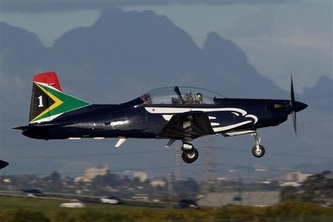 Once a thriving centre, which acted as a refuelling stop for all Imperial Airways flights from London to Cape Town, the village has reverted to its original rural stature. In these days of supersonic air travel it is worth mentioning that the trip took all of ten days in the 1940’s with flying time limited to daylight hours and passengers and crew sleeping overnight at Victoria West. The small town of De Aar, the “vein”, takes its name from an underground watercourse. Among the town’s prominent citizens was authoress Olive Schreiner, who lived here from 1907 to 1913. 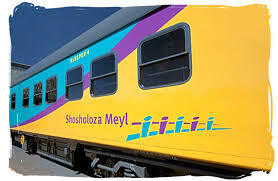 De Aar is a major railway junction and the lines from the Western Cape, the Eastern Cape, Gauteng and Namibia meet here. 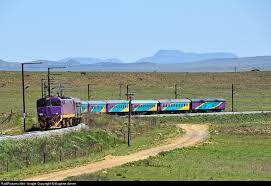 The crack trains, such as the Blue Train, Trans Karoo and the Orange Express used to stop here to change crews. Covering the south western reaches of South Africa’s interior plateau is the Great Karoo, a high (1 220m) and dry region that takes its name from a Khoi word meaning ‘land of great thirst ‘. Scientists use the name Karoo to describe the geological base for the interior plateau covering two-thirds of southern Africa. Between 150 and 250 million years ago vast sediments were laid down in a series of three distinct layers. The Dwyka Series, a layer about 900 metres thick consisting of rocks encased in a matrix of mudstone and moraine and believed to be debris of a previous ice age. After its deposition came a period of climatic change when much of the earth was covered in forests, thick swamps, huge lakes and densely vegetated wetlands. From this steamy world of mud, jungles and water the Ecca Series, a 3 000 metre thick layer of shale and sandstone, was formed. Locked into rocks of this series is a wealth of fossils ranging from small reptiles to huge tree stumps, some still upright. Above this is the Beaufort Series, a layer of sedimentary deposition about 5 600 metres thick that created the face of the Karoo as we know it today. Over time igneous material from the centre of the earth forced its way through vertical and horizontal cracks in the Karoo’s sedimentary depositions, forming dolerite dykes (vertical) and dolerite sills (horizontal). As the soft sedimentary rocks weathered away, the harder or more resistant dolerite dykes and sills remained forming the flat topped or ‘ table ‘ mountains and bell-like buttes that characterise the Karoo. The vast herds of Springbok of 150 years ago have been replaced by sheep, one of the few animals able to survive on the low-lying scrub that is the common vegetation of the Karoo. Springbok Antidorcas Marsupialis once migrated across the Karoo in herds of up to 40 000, a sight viewed by David Livingstone. He wrote at the time: “It is probable that, notwithstanding the continual destruction by firearms, they will continue long to hold their place.” How wrong he was. Today, it is rare to see a Springbok in the wild beyond the confines of a game farm or reserve. Sheep farming has become the main economic activity of the area, often on large farms of many thousand of acres. The dryness of the land is deceptive as water is relatively plentiful deep underground. To bring water to the surface farmers use windmills and the turning sails and stark outlines of these structures have become synonymous with the Karoo skyline. Kimberley is one of South Africa’s best-kept secrets. 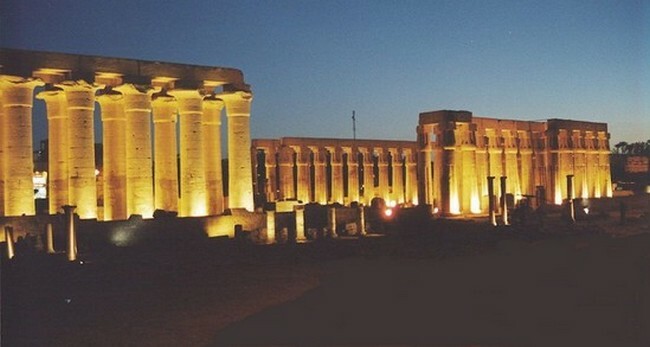 Somewhat off the beaten track, towards the arid northwest of the country, it does not receive the high volume of tourist traffic, which its history and commercial importance would presume. The story of Kimberley is the story of diamonds. The romantic associations of diamonds, De Beers, Cecil John Rhodes and the Cape-to-Cairo railway are all centred on Kimberley. Although diamonds had been discovered near Hopetown in 1867, it was the discovery of a diamond ‘pipe’ where the Big Hole now yawns, in 1871, which triggered the Diamond Rush. Kimberley’s first name was New Rush to distinguish it from the ‘old’ rush at Colesberg Kopje. The site of the Big Hole was, initially, a small hill, but that soon disappeared before the furious diggings of the diamond prospectors. The prospectors staked out their claims and began digging. Some excavated quicker than others, cloudbursts during the summer thunderstorms washed down detritus from the higher claims into the lower ones. Once the hole was deep enough, water pooled in the base and it became necessary to pump it out. In the midst of this competitive chaos, emerged two men, wildly different in background, education and temperament, but with a similar vision. Barney Barnarto and Cecil John Rhodes stamped themselves forcefully upon early Kimberley. Barnarto controlled the Kimberley Central Mine, whose diamond pipe lies immediately east of the railway station, and Rhodes controlled the De Beers Mine, where the Big Hole is found. Both agreed that the supply of diamonds to the world market had to be controlled through the formation of a monopoly or cartel, but which one would buy out the other? After intense negotiations, De Beers, with Rhodes as its Chairman, bought out Barnarto’s holdings in 1888 and promptly made Barnarto a Life Governor of the new De Beers Consolidated Diamond Mines. The company, listed on the London and Johannesburg Stock Exchanges until September 2001, still dominates the world’s supply of diamonds and the life of Kimberley. 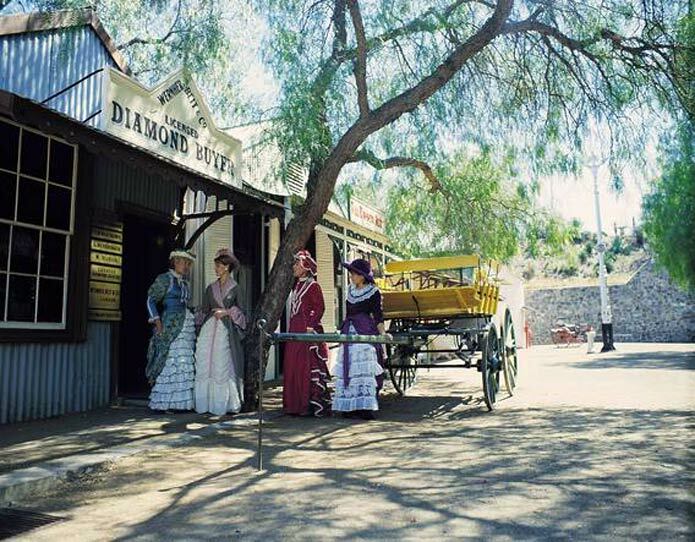 Once De Beers took control of the diamond industry, Kimberley, from having been a thrusting town of young male prospectors, became a company town. It settled down to produce its own diamonds and later to sort and cut diamonds from all over the world. Today, the Harry Oppenheimer building is the throbbing nerve-centre of the diamond-sorting business. With the discovery of gold on the Witwatersrand in 1886 and the consolidation of the diamond industry by Rhodes and De Beers in 1888, the tide of wealth ebbed from Kimberley never to return. It remains a charming town, preserved unchanged over the years owing to the presence of De Beers. De Beers Consolidated Diamond Mines still has it headquarters in Stockdale Street and every year, from New York, Zurich, Hong Kong, Amsterdam and elsewhere, the directors and shareholders of the world's oldest monopoly gather here in a quasi-rural setting for the Annual General Meeting. The Boers besieged Kimberley, with Rhodes in it, during the South African War (Anglo-Boer War) (1899-1902). The British army under Lord Methuen attempted to relieve the town but suffered two serious reverses at the battles of Modder River (28 November 1899) and Magersfontein (11 December 1899). The Black Watch suffered terribly, exposed to the intense heat and unable to advance or retreat under withering Boer Mauser fire. Finally they broke and fled. Kimberley was only relieved two months later after the great cavalry dash across the Karoo led by Sir John French and Col. Douglas Haig. At the beginning of the siege, the artillery defence of Kimberley consisted only of 7 pairs and 2.5 in RMLs. Nobody really knows who first mooted the idea of making a gun in Kimberley which could outrange the Boer artillery, but credit is usually given to George Labram, an American engineer in the town. He had come to South Africa in 1893 to erect a new crusher plant for one of the Kimberley mines, staying on to become Chief Engineer to De Beers Consolidated Mines Ltd, the company owning all the Kimberley diamond mines and which was under the chairmanship of Cecil Rhodes. A good mechanical engineer with a fertile brain, Labram not only designed and made 'Long Cecil', for which he is perhaps best remembered, but during the first three weeks of the siege he designed and constructed a plant for the bulk refrigeration of perishable foodstuffs - essential with shade temperatures averaging about 31 degrees C. He had also installed an emergency fresh-water supply system, which became the town's sole supply (apart from one or two wells) for the whole siege, and had given much practical assistance and advice to the Royal Engineers in laying out controlled minefields around the town, and with the design and actual construction of the defences. Then, as the garrison's artillery had expended nearly a third of its ammunition by the end of November, Labram turned part of De Beers' workshops over to making shells, charges, and fuses for the 2.5-inch guns. Prior to all this he had perfected a method (still in use) for the extraction of diamonds from the crushed rock of the mines. His greatest triumph perhaps was turning the workshops into a gun factory as well, never before having had anything to do with gun making. This gun was designed and constructed by engineers who had no previous experience of ordnance manufacture, without special plant or arrangements, and on designs adapted from descriptions found in a stray copy of an engineering journal. Its construction, from the day that designs were fashioned, took 24 days and, on Friday, 19 January, 1900, the gun, nicknamed 'Long Cecil' in honour of Cecil Rhodes, was taken for testing and calibration to one of the three emplacements already prepared for it. Rhodes, who had taken a great interest in the gun and its manufacture, was present, along with a number of local dignitaries and senior officers of the garrison. He invited Lt-Col Chamier, as the senior Gunner, to fire the first round. The story goes that Chamier refused on the grounds that, as a member of the Royal Regiment, he was permitted to fire only such guns as had been officially approved by the War Office and that 'Long Cecil' definitely did not fall within this category! Rhodes, so the story continues, then told Chamier to remove himself to a safe distance and sent his pony and trap to fetch Mrs Pickering, wife of the Secretary to the De Beers Company. On her arrival, Rhodes handed her the end of the firing lanyard, inviting her to pull it. This she duly did, with some trepidation, and fired the first round from 'Long Cecil' - of this latter part of the story there is no doubt. The round landed and burst in the middle of a hitherto safe and quiet Boer laager at the Intermediate Pumping Station some 7200 metres away, causing considerable alarm and dismay according to Boer letters written at the time, some of which were later intercepted by the British. 'Long Cecil' fired 225 shells against the Boers at an average range of 5,000 yards. Its activity forced the Boers to send for a 'Long Tom'. Ironically, Mr Labram was killed by one of the first shells that this 'Long Tom' fired into Kimberley. 'Long Cecil' can still be seen in Kimberley, where it stands in memory of those who defended the town during the siege. It was placed on the Honoured Dead Siege Memorial where it stands to this day. In the Museum of Artillery in the Rotunda at Woolwich there is a good scale model of the gun, made; it is believed, by Mr Harry Beer who was one of the artisans employed in making the original gun during the siege. In terms of scale and size the Kimberley Mine Museum can lay claim to being one of the most impressive museums in South Africa. It encompasses the whole area of the Big Hole and utilises many of the original corrugated iron mine buildings used by the first miners. It tells the story of the diamond industry as no other. It should be remembered that before the discovery of diamonds in the Northern Cape in 1867, diamonds came, almost exclusively from India and Ceylon. Their source and origins were shrouded in mystery and legend being believed to be the congealed tears of a Hindu goddess. In that sense, the Kimberley mine Museum is of world-historic importance because it shows how the diamond industry was transformed mechanised and industrialised in the late 19th century. And together with diamonds went the men who found them, colourful, thrusting personalities who lived hard and played hard. 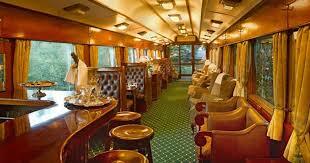 The railway coach commissioned for De Beers from the Pullman Company, Chicago, shows clearly the plush comfort and the well-stocked cellars with which the directors travelled. The ‘Big Hole ‘started off life as a small hill, was flattened, and is now an enormous hole from where millions of tons of diamondiferous ' blue-ground ' Kimberlite ore has been removed. The diamonds were made about 53 million years ago, about 200 kilometres inside the earth, under conditions of unimaginable heat and pressure. Carbon was metamorphosed into diamond, the hardest substance known to Man. Literally thousands of claims were pegged as would-be miners from all corners of the world sought to make their fortunes. Millions of tons of ore were removed as the diggers continued their search hundreds of metres below ground level. Typically, volcanic activity goes hand in hand with the increasing weight of water in a lake or sea. The floor of the Karoo Sea sagged under the weight of the water, broke the earth’s crust and allowed magma to well up from the depths, creating a volcanic pipe or ‘throat.’ This process is still continuing in central Africa where volcanic activity of the Ruwenzori Mountains in Uganda is a function of the weight of water in the Rift Valley lakes. 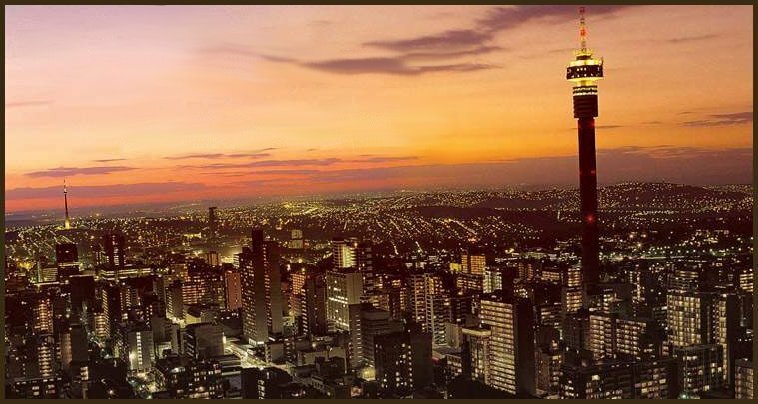 Gauteng (pronounced with a guttural G) is the smallest and richest of the nine regions formed in terms of South Africa’s Interim Constitution of 27th April 1994. The name is a Sotho tribal verbal corruption of the Afrikaans word ‘goud’ which means gold. The gold bearing main reef was first struck by an itinerant prospector named George Harrison when he stumbled across an outcrop edging above the surface of the land. His ‘ Discoverers Claim ‘ can be viewed in a park four kilometres west of the city centre where sandy quartz ‘ conglomerate ‘ which trapped the fine gold dust around 2700 million years ago is still clearly visible. The gigantic forces of nature were once again responsible for producing the gold metal so precious to the South African economy today. Volcanic rock formed by the embryo earth in its first incarnation was scoured and eroded away over hundreds of millions of years by large bodies of water. Gold was released from the reluctant grip of the igneous rock and washed southwards to be held for an eternity in a series of fossilised beaches. A great and enormously violent upheaval, perhaps associated with the break-up of the continents, faulted this deeply sedimented beach upwards, allowing it to subside again southwards through an angle of 35 degrees. Eons later, Man arrived to burrow into one of Nature’s greatest wonders - an almost inexhaustible supply of gold - a lustrous, highly valued commodity tightly held in vast quantities by the major nations of the world. From their infancy in the early days of 1886, the Witwatersrand gold fields - stretching along a gentle 120km curve from Benoni to Krugersdorp - proved themselves unique. The amount of gold in the ore was and still remains low, but the total reservoir of gold-bearing ore appears to be limitless. These two factors have determined the profile of the gold mining industry in Africa - no single person can manage the industry, unlike the diamond industry which gave rise to great tycoons like Rhodes and Barnato - and only a mining house, consisting of several large shareholders, could raise the imposing capital needed to successfully mine and process the enormous quantities of ore from which small quantities of gold are finally extracted. The mine dumps of Gauteng, many of which are disappearing as they are reprocessed using advanced technology to capture small quantities of gold which escaped in the less refined methods of past years, are testimony to the scale of mining operations carried out over the years. The deepest mines in the world, 4.7 kilometres below the surface of the earth, are found in South Africa. Mining houses usually control many mines in order to reduce financial risk and to benefit from economies of scale. The milling of the ore is only half the equation. The other half is the extraction of the ore in harsh conditions many kilometres underground, using cheap labour provided by great numbers of able-bodied men from throughout Southern Africa and specially Mozambique. That is one of the ironies of the South African gold mining industry - opening a new mine, with all its high technology infrastructure and deep mining skills, costs billions of Rands. And yet relatively unskilled labour using specially developed, costly equipment is used to mine the ore. Yet despite their size, the mining houses act as the entrepreneurs, identifying new prospects, carrying out exhaustive feasibility studies and keeping the country’s economy buoyant as they extract gold from the earth. Names like Anglo American, Anglo Vaal, JCI and Gold Fields dominate the Johannesburg Stock Exchange and perforce, the South African economy. The harsh reality involved in squeezing gold from grudging ore is reflected in the lack of aesthetic presence in Johannesburg. 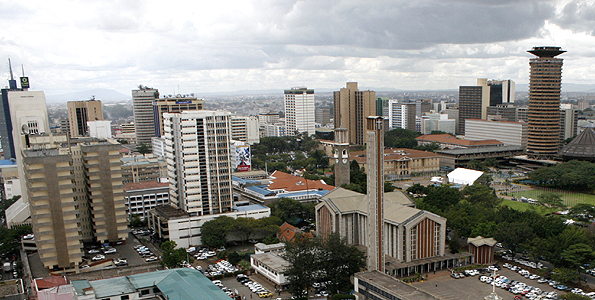 In a city, which is barely over 100 years old, only four buildings predate 1900. 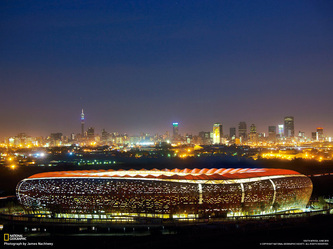 South Africa owes its state of development to gold. The 600 tons of precious metal produced every year by the mining houses has paved the way, directly or indirectly, for the industrialisation and modernisation of a traditional African society. Today, with a new and democratic government in place, South Africa has taken up its rightful role as the powerhouse of the African continent. Johannesburg is the largest city in sub-Saharan Africa. 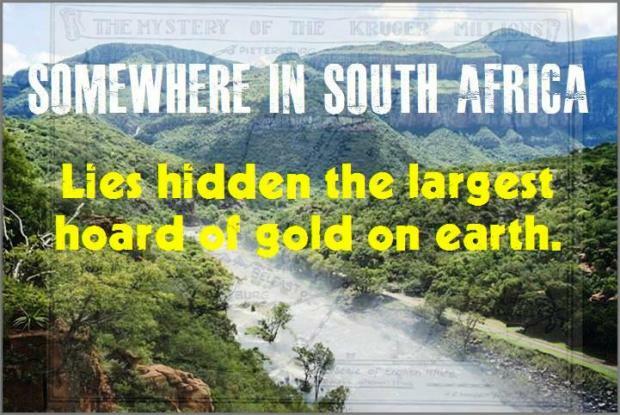 It is on the heights of the Witwatersrand, some 1828 metres above sea level, that the greatest goldfields in history were discovered before the turn of the century. Prior to 1886, maps of the area where Johannesburg now stands depicted only a series of bush-covered ridges from which flowed a few small streams. 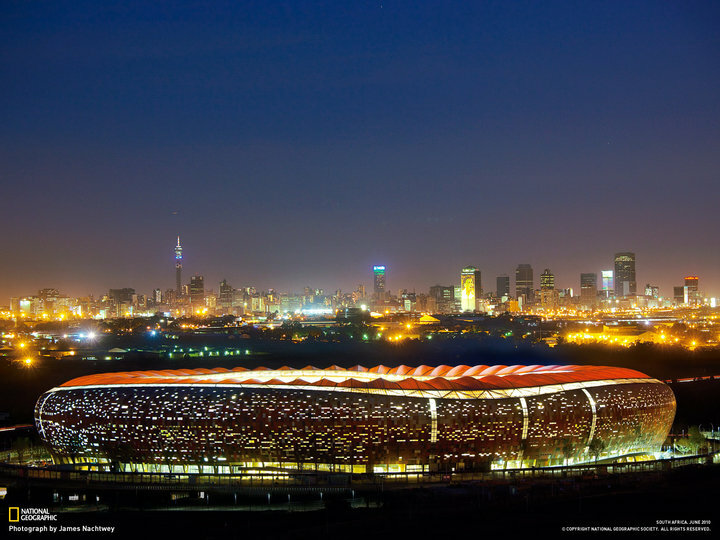 When gold was discovered on the Witwatersrand, a vibrant tent town grew rapidly into a frontier city and then into a dynamic commercial and financial centre, now the capital of the Gauteng region. Until recently, the region was known as the PWV, meaning Pretoria-Witwatersrand-Vereeniging. Early signs of man’s first settlement along the banks of the Apies River, in whose two broad and well-sheltered valleys Pretoria is situated, go back at least 350 years. Both Sotho and Ndebele people have dwelt here and in 1825, Mzilikazi, the renegade Zulu chief who deserted Shaka with a number of followers established a stronghold on the banks of the Apies. The first European traders and the missionary Robert Moffat visited him there. Other Zulus also came to call and stories of his newfound prosperity soon spread. Shaka learnt of Mzilikazi’s whereabouts and sent his armies to obtain retribution for his desertion. Mzilikazi warded off the attack but was forced to flee to the Marico district in the Western Transvaal. In 1837 the Voortrekkers discovered the fertile valleys of the Apies River and set up a number of farms in the area. One of these early settlers was Andries Pretorius, a hero of the battle of Blood River, who established a farm in the valley at the confluence of the Apies and Crocodile rivers. Shortly after his death the Apies valley was chosen as the site for the capital of the newly created Boer republic, the Zuid-Afrikaansche Republiek (ZAR). Marthinus Pretorius, son of Andries, selected a site on the farm Elandspoort and on 16 November 1855 the new town was named Pretoria in honour of his father. Pretoria grew up around Church Square, originally the market place and focal point of the Boer community. 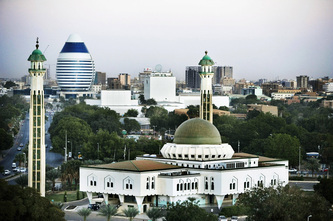 Several impressive buildings were built around the square such as the Palace of Justice and the old Raadsaal (parliament) of the ZAR. 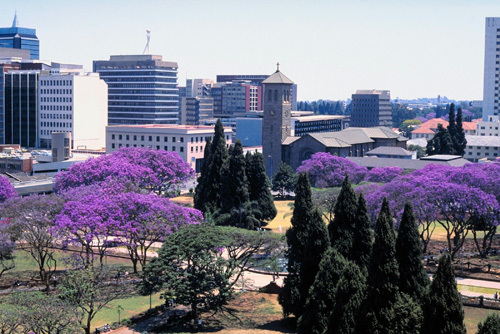 Today Pretoria is the administrative and diplomatic capital of South Africa. The most notable of the cities edifices is the Union Buildings; designed by Sir Herbert Baker and built on Meintjieskop, the hill that dominates the centre of Pretoria. Built on a low hill outside the city is the monolithic Voortrekker Monument. Completed in 1949 to commemorate the Voortrekkers’ pioneering spirit, it is seen by some as an important memorial to Afrikanerdom and by others as a reminder of apartheid. 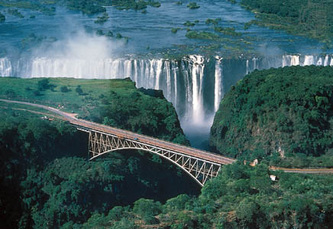 Its interior frieze is said to be the second longest in the world. During October and November Pretoria seems to shimmer with a mauve haze of blossoming jacarandas. In 1888 a citizen of Pretoria, J A Celliers imported two Jacaranda Mimosifolia trees from Rio de Janeiro. He planted them in the garden of Myrtle Lodge, his home in the suburb of Sunnyside. They still stand in the garden of what is now Sunnyside School. In 1898 James Clarke obtained a contract to grow trees for the government. He ordered seed from Australia and included in the selection was a packet of seeds of the same species Celliers had imported. Clarke planted the seeds in the State nurseries at Groenkloof where they flourished. Today about 70 000 of these beautiful trees line the streets of the city. When the railway from Pretoria to Lourenço Marques was built in 1894 it passed close to Witbank (1 622ms) and a full-scale coal industry developed. This principally mining town is centrally situated in a coal-mining belt where 45% of South Africa’s coal is produced. The Witbank coal seams have an average width of 6 metres, are practically horizontal and lie no deeper than 300 metres below the surface. There are 22 mines in the vicinity and the reserves of high quality steam coal found here should last for the next 500 years. The Witbank area has a special if unheralded significance for Anglophiles since it was here that a young Winston Churchill, as an escaping British prisoner-of-war, took refuge in a mineshaft in December 1900. He later jumped a freight train on the same line on which the "Pride of Africa” travels and made good his escape to Lourenço Marques (now Maputo) in Mozambique. At 1 970ms Belfast is the highest train station between the coast and Pretoria. The train passes through Machadodorp at 1 609ms, named after General Machado - the Portuguese engineer responsible for building the Mozambican section of the railway line. 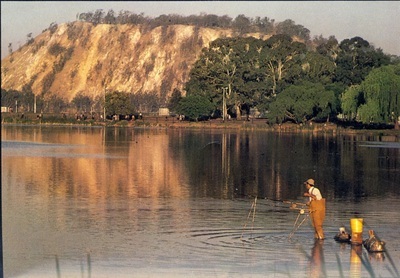 The rolling hills of this region are renowned for the genteel yet skilful sport of trout fishing, a pastime popular with executives eager to escape the pressures of city life. 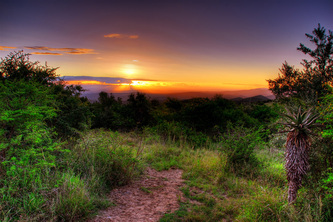 The drop from the escarpment to the Lowveld is negotiated between the quaintly named towns of Waterval-Boven (1 471ms) and Waterval-Onder (1 310ms). Although only six kilometres apart as the crow flies, the journey by rail covers 14 kilometres of switchbacks and tunnels. Traversing the escarpment was not always easy as when engineers of the Nederlandsche Zuid-Afrikaansche Zpoorweg Maatshapij (NZAZM) built the Eastern line between Pretoria and Lourenço Marques (Maputo), trains were assisted up to the escarpment utilising a ratchet between the rails. With a steep gradient of 1-in-20, it was little wonder that a rack railway system had to be used. The narrow NZAZM tunnel and bridge can be seen from the train on the cliff side. 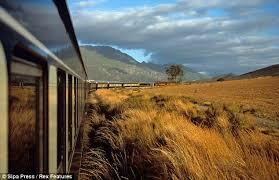 The eastern line was completed in 1895 and opened by President Kruger and the Portuguese governor of Mozambique. Exactly 100 years later, to commemorate the centenary, President Mandela and President Chissano of Mozambique travelled along the same route. Waterval-Onder was, from June to August 1900, the temporary capital of Paul Kruger’s South African Republic as he sought vainly to withstand the might of the British war machine during the Anglo-Boer War (1899-1902). As the British Army advanced down the line from Pretoria, he retreated and finally crossed the border into Mozambique and went into exile. When the eastern line was constructed up the Crocodile River Valley in 1892, a station was built on a farm owned by the Nel family. 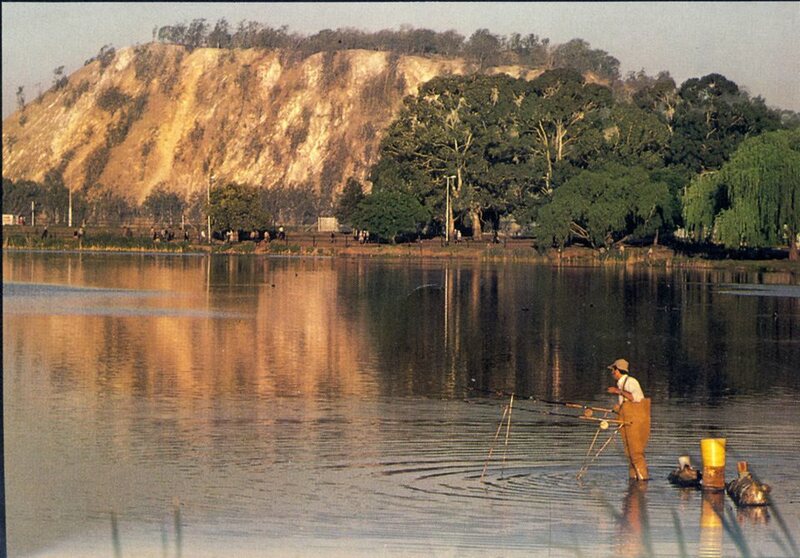 Known as Nelspruit (Nel’s stream), the station was the natural centre for the fertile reaches of the valley. Farmers recognized the potential for irrigation – good soil, a level valley floor and ample water from the river. Early farmers such as Hugh Hall settled in the area, growing citrus, litchis, mangoes, avocados and nuts. His legacy continues today with the Hall & Sons holdings evident in all aspects of the farming community. The area became the second largest grower of citrus fruits in South Africa after Zebediela and is the home of the Government Research Institute for Citrus and Subtropical Fruits and the Lowveld Botanical Garden. Today Nelspruit (716ms) is a substantial and attractive town settled amidst orange groves and dominated by a cluster of granites domes. Flowering trees shade the streets and in December and January the town seems aflame with the brilliant scarlet of flowers of the Flamboyant or Poinciana Delonix regia tree. The town is an important tourism centre with many visitors stopping en route to the Kruger National Park. On 26 March 1898, Paul Kruger, president of the ZAR signed a proclamation declaring the area between the Sabie and Crocodile rivers a game reserve and nature sanctuary. 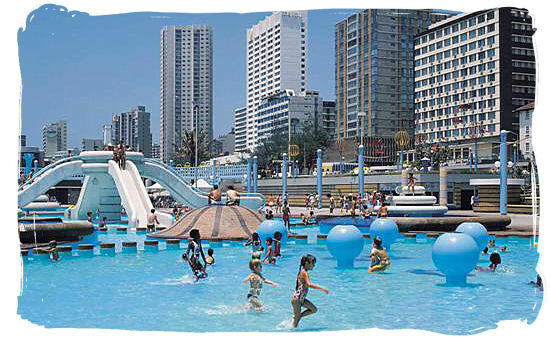 The Park is today one of South Africa’s premier natural resources visited by thousands of tourists from around the world. Under its inspired early warden, Colonel Stevenson-Hamilton, the Park was doubled in size and poaching was largely eradicated. The local Shangaan tribesmen named the warden ‘Skukuza’ meaning “he who scrapes clean”. The park’s foremost camp with adjoining airfield is named Skukuza in honour of Stevenson-Hamilton. The Kruger covers 19 633 square kilometres (1 948 528 hectares) and contains more than 200 species of trees and is home to over 450 bird, 147 mammal, 115 reptile, 50 fish, 33 frog species and a seemingly endless variety of insects. The park has five main botanical divisions. 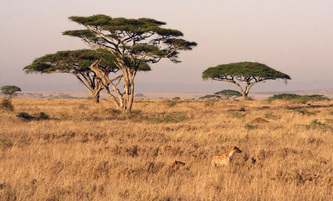 The environment and natural food of each division determine the variety and density of wildlife within its boundaries. The Hoedspruit Research and Breeding Centre for Endangered Species (the Centre) are situated on 100 hectares within the Kapama Private Game Reserve, a reserve found near the town of Hoedspruit in the Northern Province of South Africa. Established in 1988, the Centre is the brain-child of Lente Roode, the wife of successful businessman Johann Roode. It was initially established as a breeding programme for the then endangered cheetah, but following the enormous success of the cheetah breeding programme, has evolved into a legitimate breeding programme for other endangered African animal species. The ultimate objective of the Centre is to return endangered African species to the wild once their numbers have increased to such an extent that they can be released. Needless to say, this is a long-term objective which requires substantial commitment, both human and financial. One of the most successful cheetah release projects was undertaken in June 1993, when two cheetahs were set free on the 2 000 hectare Hoedspruit Air Force Base. The Air Force Base had been faced with a severe safety hazard caused by small game wandering onto the runways. By all indications the pair has been successful in hunting game and are, in fact, thriving in their new environment. Following the success of this project two more cheetah were released onto the nature reserve surrounding the Louis Trichardt Air Force Base on September 1996, and all indications are that they are as successful as the Hoedspruit pair in adapting to their new surroundings. Seven years down the road visitors to the Centre are able to see, at close range, successful breeding programmes involving cheetah, the rare African wild dog, the African ground hornbill, the blue crane, the aardwolf and other cat species such as the African wild cat, serval and black-footed cat. A group of bald ibis will soon be introduced to the Centre as well. In 1995, the Centre became home to two African wild cats when Dr Ferdi Schoeman of the Pretoria National Zoo invited the Centre to assist with the Zoo's African cat breeding programme. The first litter of this endangered cat species was born at the Centre in September 1996. In May 1991, an African wild dog programme was initiated with the arrival of seven dogs which had broken away from a pack of twenty on the nearby Klaserie Nature Reserve. The pack had been under threat from local farmers as the African wild dog is known to take livestock. In association with the Zoology Department of the University of Pretoria, the Centre is studying this rare African mammal's behaviour patterns and breeding potential with the objective of ultimately releasing the pack into a suitable wilderness area. The success to date of this programme can be seen in the present size of the pack, i.e. nineteen dogs. Visitors are also able to witness feeding sessions of various rare African vultures as the birds swoop down into the Centre en route to a specially designed feeding platform known as a "vulture restaurant". These vultures are fed the remains of carcasses left over from the feeding of other animals at the Centre, thus ensuring that nature's food chain is maintained. The Centre presently has six ground hornbills in its breeding programme which is run in association with the Pretoria Zoo. A specially designed cage was constructed which features uniquely built perches and swings, large trees, nesting sites, and measures six metres in height. This bird species is best known for the strange sound it makes as well as its adherence to the Kane and Able syndrome, i.e. the first born kills off the second born chick. To prevent this, the second born is removed from the nest and raised by personnel at the Centre. On 22 April 1995, the Kapama Veterinary Hospital was officially opened at the Centre. Headed by full-time veterinary surgeon, Dr Peter Rogers, the hospital consists of a consulting room, a fully equipped operating room and a quarantine section with special temperature control and other monitoring facilities. The hospital plays a major role in the Centre's research programmes on the breeding of endangered animal species in captivity and is assisted by a Research Committee under the chairmanship of Prof. Nick Kriek of the University of Pretoria. At times the Centre, and particularly the hospital, is called upon to assist in the rehabilitation of other animal species which have been injured or become destitute. At present, a four-month-old elephant bull is being cared for at the Centre. A seemingly rare male lion with a distinctive black mane can also be viewed at the Centre. This predator was rescued from a Mozambican zoo in late 1996. Initial research indicates that this lion (species) is very different to any lion found in sub-Saharan Africa. It is believed that this particular lion may be related to the extinct Cape lion which became extinct in the Northern Cape in 1850. Funding of the Centre is generated by gate takings as well as sales from the Centre's curio shop. It is essentially a non-profit organisation as all revenue is ploughed back into the running of the Centre. The objective is not to run the Centre for financial gain but as an operation that will make a fundamental contribution to the preservation of Africa's endangered animal species. Polokwane (formerly Pietersburg) lies just south of the Tropic of Capricorn. 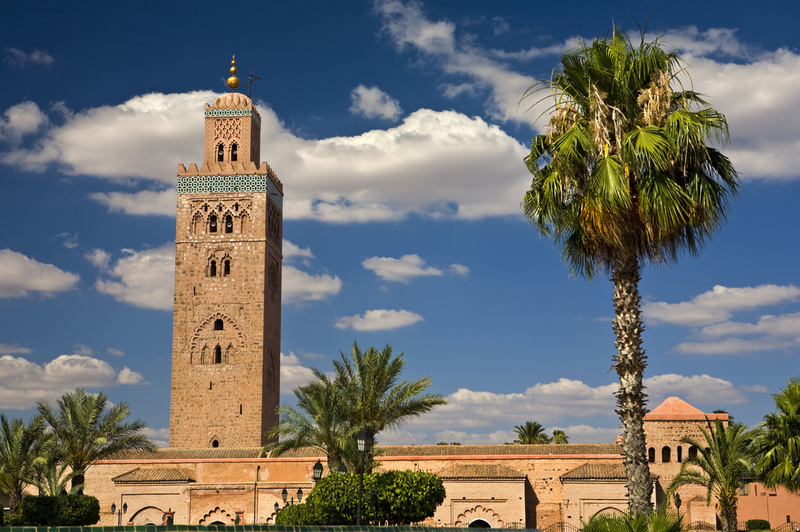 Despite the town’s location on the tropics, the climate is invigorating because it stands on a plateau 1 280ms above sea level. Wide streets, jacaranda and coral trees, colourful parks and sparkling fountains characterise this principal town and capital of the Limpopo Province. In addition to its status as a major commercial and agricultural centre, Polokwane is the cultural hub of the region, featuring impressive art exhibitions and elegant historical buildings. In the vicinity, the countryside is the setting for some of the most prosperous cattle ranches in South Africa. 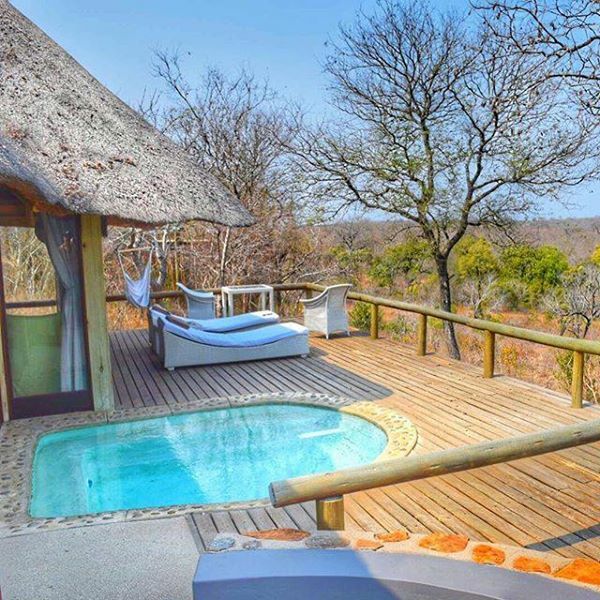 Strategically placed on the Great North Road (N1), and halfway between Pretoria and the Zimbabwean border, this is a popular port of call for visitors en route to the Tzaneen area and the northern part of the Kruger Park. The principal attractions of Limpopo lie in its three wild and distinctive mountain escarpments. The most significant of these is the first rise of the Drakensberg Escarpment, on its long sweep through South Africa from north to south, marking the descent from Highveld to Lowveld. On the otherwise ordinary western side of the Great North Road lies the more sedate Waterberg massif. Once a sphere of cattle farming and hunting, the area in the last two decades has altered into a region dedicated to wildlife conservation, becoming a UNESCO Biosphere and offering malaria-free Big-Five game viewing. In the north, lying parallel to the Limpopo River and bisected by the N1, are the subtropical Soutpansberg Mountains, and the intriguing and still very independently minded Venda district, a former homeland, to the east. The landscape looks identical to that of the Tanzanian southern highlands and one now has the sensation that one is entering authentic Africa. The Venda people are believed to have migrated here from the great lakes of central Africa and have a distinctly Nilotic look. After Soekmekaar we enter Baobab country. The Adansonia digitata or Cream of Tartar tree only grows within the tropics in Africa. The Africans believe that an ancient giant, in a fit of rage, uprooted the trees and put them back into their holes upside down. Hence their roots are in the air. Few sights are more evocative of primeval Africa than the eerie silhouette of a Baobab tree, starkly outlined against a ruddy winter sunset. Bandelierskop is on the edge of the escarpment and where the Highveld drops precipitously from 1 219ms down to 609ms. On the very edge of the ancient cliffs, suspended above spectacular scenery lies the unique habitat of the 'living fossil' known as the Cycad. Completely unchanged over 120 million years of the fossil record, these· slow growing 'bread trees' were genuine dinosaur-food. Heavily protected against theft, a permit is required to move a cycad. A 1.5-meter high cycad costs anything up to R5O 000 and is about 200 years old. Here it was that an enigmatic Australian trooper known to history as ‘Breaker’ Morant, during the Anglo-Boer war, shot unarmed Boer civilians and a German missionary and his servant. For this he was court-martialled at Pietersburg and shot before a British Army firing squad in Pretoria. An Australian cult film based upon this story was made in the 1970’s. The town of Makhado (949m) - formerly Louis Trichardt - emerged out of the settlements of Dutch Voortrekkers, who were travelling as far as possible away from British influence in a country they considered their own. The Dutchman, Louis Trichardt arrived at the foot of the Soutpansberg Mountains in 1836, and thought it a fine place to settle. Another party led by Hans van Rensburg continued towards Mozambique probably due to arguments between the two men. For almost a year Trichardt’s little community planted crops and explored the country. They searched for Van Rensburg’s group but never found them as it turned out they had all been killed along the way. Some time later Trichardt and his followers decided to move on east but 26 out of 53 succumbed to malaria and other diseases. Ten years later, one Hendrik Potgieter settled here and a town developed in the area that Trichardt had left behind. 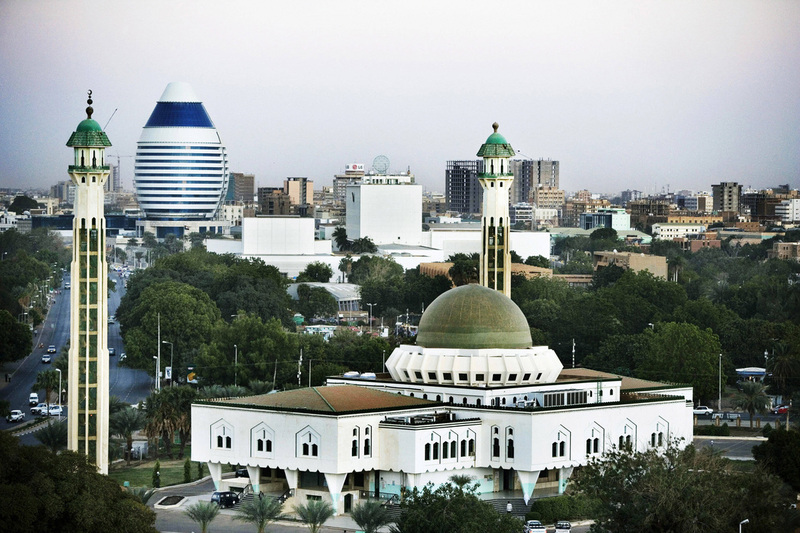 The Northern Province was positively bursting with game and an unruly crowd of hunters and ivory traders made this town their base. Conditions became increasingly chaotic and the endless brawling and fighting with the local Bavenda tribes finally destroyed the place. The Europeans finally abandoned Louis Trichardt in 1867. Over 30 years later the Transvaal Republic regained control and proclaimed the town the administrative centre. Today tropical fruits, tea, coffee and timber are produced from the fertile land but visitors tend to be coming or going to the Kruger National Park to see the game that no longer roams free in these hills. The copper mining centre of Musina (594m) – formerly Messina – is the northernmost town in South Africa. The town lies 2 003 kilometres from Cape Town and 16 kilometres from the Zimbabwean border. Copper was first discovered here in prehistoric times. The discoverers called it Musina (the spoiler) because it adulterated the metal they were really looking for – iron. They learned to use the copper and, as well as making cooking utensils, fashioned it into ingots which became standard items of barter with neighbouring peoples and Arab traders. The copper was ‘re-discovered ‘shortly before the Anglo-Boer War when a prospector, John Pasco Grenfell, met a hermit known as Wild Lotrie who told him about the old mines. Grenfell was amazed to find rich lodes of high-grade copper and the town grew up to serve the reworked mines. South African border formalities take place at Musina and Zimbabwe formalities take place at Beit Bridge. The bridge, paid for by the Beit Trust, and completed in 1929, has a large memorial at the centre to Sir Alfred Beit, Cecil John Rhodes' accountant. Over the 'grey-green, greasy Limpopo', written of by Rudyard Kipling, it will creep. The river is usually completely dry in the winter, but may flood during the summer.